Most solar chargers are either gimmicks that would struggle to juice up a lemon, or giant packs you need a car to haul around. 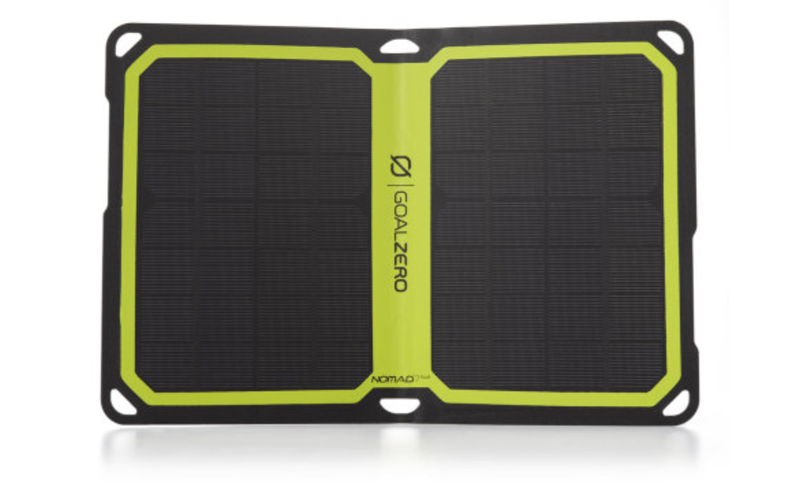 Goal Zero’s new Nomad 7 Plus looks like it might tick the holy grail of small, cheap, and useful. Goal Zero is best known for providing solar power for outdoor photographers, van dwellers, and serious Everest expeditions. It’s a company with a ton of credibility making robust gear for real-world use. So, when it makes a $100 solar panel that can actually charge smartphones in a reasonable time while still being portable, it’s worth listening. I say “actually charge” because I’ve owned a bunch of cheap solar chargers before, and they all sucked. If a solar panel can’t produce enough consistent power to charge a phone, it’s going to take all day to get any battery charge, and the weak charge will also damage your device’s battery in the long term. The Nomad 7 Plus promises consistent 7 watt, 1.4 amp charging, thanks to a power regulator that helps smooth out the inconsistencies that come when you’re charging with a nuclear fusion reaction 100 million miles away. There’s no built-in battery, so you either need to charge your device directly, or pump that power into a separate USB battery pack. The physical design also looks good: it’s about the same size and weight as a paperback book, and comes with a weatherproof design and magnetic kickstand, so you can get the optimal angle to the sun. It goes on sale today for $100.